The pioneers played a key role in the Middle Missouri Valley. Research shows how broad their influence was. Thirty years ago, you couldn’t find even one LDS listing in the telephone directories of the Greater Omaha-Council Bluffs-Bellevue area. The Church itself had only three little branches that met in small buildings purchased from other churches or in government facilities on Offutt Air Force Base, Bellevue, Nebraska. Few non-LDS historians knew much about LDS history in the Middle Missouri Valley. Today, things are much different. Council Bluffs, Iowa, recently named its rerouted main thoroughfare Kanesville Boulevard, in recognition of the name the Latter-day Saints first gave the settlement which, in 1853, became Council Bluffs. Both Council Bluffs and Omaha, Nebraska, have set aside public land at the sites of the Mormon Battalion Mustering Grounds and Cutler’s Park for LDS historical markers. Busloads of school children visit Mormon Pioneer Cemetery and Information Center in north Omaha. 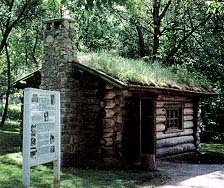 Replica of a typical cabin at Winter Quarters. The cabin and its accompanying historical signboard stand two hundred feet south of the Mormon Pioneer Information Center. Why the dramatic change in interest? One reason may be that the Church has grown significantly in eastern Nebraska and in southwest Iowa. Today there are two stakes in Greater Omaha and one in nearby Lincoln. Tourist trade from Church members interested in their heritage has grown considerably. Then, too, more and more nonmembers are learning about the prodigious productivity of the Saints during their seven-year stay here, from 1846 to 1853. French explorer-traders in the early 1700s and Spanish fur trappers and traders in the late 1700s recognized the importance of the area as a crossroads to the West. The Saints, coming nearly 150 years after the French started working the area, found a large French village there. LDS journals referred to Point aux poules as Trading Point.3 They said the village had several blocks of residences and at least three trading houses. Bellevue, just west across the Missouri River, consisted of about twelve cabins, a trade post, and a U.S. Indian Agency. Not until the Saints entered the area, though, were any substantial settlements established. In the winter and spring of 1846, the Saints struggled across the raw prairies of Iowa in wagon trains. Coming through southwest Iowa, they built, on an average, one bridge per day.4 Of those bridges, Thomas L. Kane later said they were no ordinary bridges﻿—they could bear heavy artillery.5 When the Saints reached the Missouri River 14 June 1846, they were in old Council Bluffs, a district that stretched roughly from present-day Fort Calhoun, Nebraska, to Glenwood, Iowa. The Middle Mormon Ferry was built three miles west, over the Missouri River. The settlers tested it during the night of 29 June 1846 by taking Nauvoo Legion arms and ammunition to the west bank. The ferry opened to public use July 1, carrying wagons and families across the river day and night, weather permitting. The wagons moved four miles west to a spring-fed lake and repeated the Grand Encampment parking pattern. The new site was called Cold Spring Camp. Meanwhile, on the east side of the river, thousands patiently waited at Grand Encampment for turns to use the ferry. The huge numbers of refugees and their livestock rapidly exhausted the wood, water, and grass, however, and Grand Encampment began to break up as wagonmasters sought new campsites with uncontested access to those necessities. One wagonmaster, Bishop Henry W. Miller, took his wagon train near to what is today downtown Council Bluffs. One of his captains bought the old Blockhouse, built in 1837 by U.S. dragoons to protect the Pottawattamie Tribe against possible attacks by the Sauk and Dakota Sioux Indians. Miller’s Hollow grew up around the Blockhouse. The Blockhouse Branch of the Church got its name from that historic building. The town was renamed Kane in 1847, then Kanesville in 1848. Blockhouse marker at the end of East Pierce Street. This was the site of the Blockhouse Branch of the Church and the nucleus around which the community of Miller’s Hollow﻿—renamed Kanesville in 1848, then Council Bluffs in 1853﻿—was built. 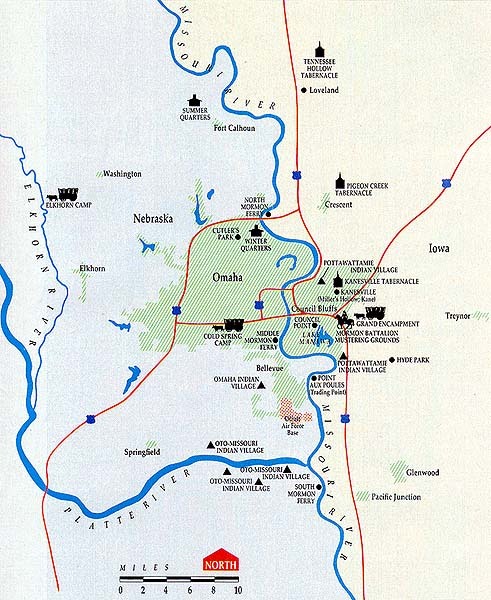 By about August 1, the Council of the Twelve decided to abandon plans to move west that year.9 They felt the Church would be safer if the vanguard remained by the Missouri River, ready to assist stragglers still striving to leave Nauvoo or the repair camps at Garden Grove and Mount Pisgah in south-central Iowa. On August 6 and 7, the pioneers at Cold Spring Camp pulled down their tents, loaded their goods and children into their oxdrawn wagons, and moved nine miles north to a site they called Cutler’s Park. William Clayton wrote, “Heber’s camp is formed in a kind of parallelogram, each wagon camped in a perfect line with the others. The square in the center is about twenty five rods [412.5 feet] long and fifteen rods [247.5 feet] wide.”10 The Saints built a public square with a speakers’ stand, benches, and leafy arborwork to protect the audiences from the hot summer sun. At the new site, the pioneers laid out streets wide enough for an ox-drawn wagon to turn around. They built log cabins twelve- to eighteen-feet long, sod houses, and dugouts, some of the structures half emerging from the hillsides. By March 1847, Winter Quarters’ population had reached almost five thousand. Many more lived in many smaller, hastily constructed towns in southwest Iowa. 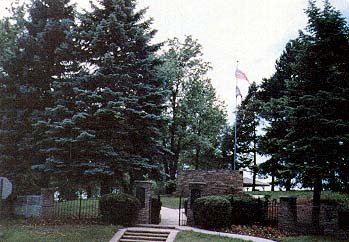 Main entrance to Mormon Pioneer Cemetery, across the street from the Mormon Pioneer Information Center in Omaha, Nebraska. The cemetery lies about a quarter of a mile west of where the city of Winter Quarters was. When the well-prepared went west from Winter Quarters to the Great Salt Lake Valley in 1847 and 1848, the less-prepared moved back to Iowa. Most went to Kanesville, and the city ballooned to between seven and eight thousand residents. Kanesville flourished for five more years, serving as a way station for pioneers and Gold Rushers passing through, until the last of the faithful Saints had left the city. Close to nine thousand Latter-day Saints also had disembarked from riverboats at Kanesville Landing, just west of Lake Manawa in present-day south Council Bluffs. They were going to Salt Lake City. That number is in addition to those who traveled by covered wagon. A growing circle of historians realize the history of western Iowa and eastern Nebraska must be revised. More and more are coming to understand how crucial the Saints’ Missouri Valley heroics were to the settlement of the American West. Sometimes we think of a huge gap in LDS settlements between Nauvoo and Salt Lake City. But en route to the Great Basin, the Saints built other important towns. Winter Quarters, Kanesville, and more than fifty other LDS communities were keys to the Saints’ successful move west﻿—planned and built under the inspired direction of scores of Church leaders, just as Nauvoo had been and as Salt Lake City would be. Andrew Jenson’s report, Manuscript History of Iowa, 10 October 1848, does not include these communities: Allred’s Branch (Little Pigeon? ), Barney’s Grove, Bertrand, Bethlehem, Big Grove, Bluff City (McOlney’s? ), Boyer, Brownell’s Grove, Browning’s, Carterville, Cooley’s, Coonville, Davis Camp, Farmersville, Ferry Branch (Ferryville? ), Harris Grove, Hyde Park, Indian Mill, Indian Town, Keg Creek, Kidd’s Grove, Little Mosquito, Little Pigeon (Allred’s Branch? ), McClellin’s Camp, McOlney’s (Bluff City? ), Nishnabotna, North Pigeon, Perkin’s Camp, Pigeon Creek, Pigeon Grove, Plum Hollow, River Branch, Rockyford, Rushville, Shirt’s Branch, Silver Creek, St. Francis (Trading Point), Tennessee Hollow, Union, Unionville, Upper Cag (Keg) Creek (North Keg Creek? ), Welsh Camp, West Fork Boyer. Merrill J. Mattes, Platte River Road Narratives (Urbana and Chicago: University of Illinois Press, 1988), p. 3. Frontier Guardian (Kanesville), 29 May 1850, p. 3; Western Bugle (Kanesville), 16 June 1852, p. 2; “William Clayton’s Journal,” Deseret News, 1921, p. 47. Andrew Jenson, Journal History, June 1846 entries. Thomas L. Kane, “The Mormons, a Discourse Delivered before the Historical Society of Pennsylvania, 16 March 1850,” in Albert Zobell, Jr., Sentinel in the East (Salt Lake City: Nicholas G. Morgan, 1965), Discourse appendix, p. 41. Hosea Stout’s journal, about 5 July 1846. Letter from Council of the Twelve to Bishop George Miller at North Loop, 1 August 1846, instructing him to camp and prepare for winter. William Clayton Journal, 7 August 1846, LDS Church Archives. Journal History, 27 August 1846. Sexton’s handwritten record of burials at Winter Quarters, LDS Church Archives. Surgeon General’s Report, 1 July 1820, National Archives, Washington, D.C.
Gail Geo. Holmes is adviser to the Old Council Bluff(s) Historical Recovery & Development Group (HRD). He serves on the high council of the Omaha Nebraska Stake. Photography by Gail Geo. Holmes.